After numerous demonstrations of electric-car mobility, it is certain that electric cars are part of our future, but that nagging question in its shadow has been all about how to keep them going. ABB's announcement this month about its new charger is worth a look at more talk involves the kinds of infrastructure being readied for electric vehicles. 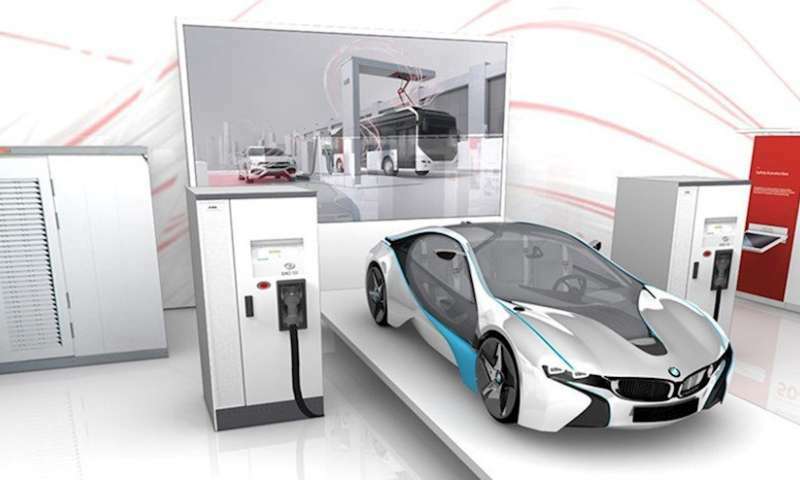 ABB launched a charger model at this year's Hannover Messe. This charger was described as a 350 kW fast charger called the Terra High Power charger. The photovoltaics site, pv magazine, said it can charge an electric vehicle (EV) in just 8 minutes and it adds up to 200 km (124 miles) of range. An event photo showed a sign "recharge for 200 km in just 8 minutes." This is noteworthy because it can add seven times more range in the same time than current models on the market, said pv magazine. Charging is a big issue for drivers anxious about being able to depend on electric vehicles to get to their destinations, near and far. "In order for electric cars to be fully accepted as long-range touring vehicles, they'll need these kinds of crazy charge rates and more, considering that fossil fuel-powered cars can be filled up in a matter of a few minutes," said Loz Blain in New Atlas. SmartCitiesWorld said the charger's ultra-high current has the capacity to charge both 400V and 800V cars at full power. The new charger is ideally suited for use at highway rest stops and petrol stations. That brings us to the shadows and doubters who hesitate to ponder charging options while on the road. "Although there are several carmakers promising fast charging capabilities for their electric cars, there's really not that many fast charging stations to go around. When they do become more commonplace, the real electric car revolution will likely begin," said autoevolution. "When the charger is deployed on the world's roads, it will come in pairs that will allow two EVS to be charged at full power simultaneously." Several writers raised the issue of battery degradation. In CleanTechnica, James Ayre said adding up to 200 kilometers of range to an EV in around just 8 minutes or so "presumes, of course, that such an EV is equipped to handle such a charge (and without overheating and accompanying battery degradation)." "The ability to accept ultra-fast charging is just another criterion on the list for battery developers to satisfy, alongside energy density, thermal stability, charge cycle life and many others. Indeed, charging batteries this fast can be just as deleterious to battery life as massive power output rates," said Blain. Meantime, SmartCitiesWorld talked about a two-power cabinet charging system as part of the scenario. "The addition of dynamic DC power sharing technology allows a two-power cabinet charging system to charge a couple of electric vehicles (EVs) simultaneously, with up to 350kW, while dynamically optimising the available grid connection and the power delivery to the two vehicles." More power cabinets and charge posts can be added after installation. ABB said the charger has been selected for use by Electrify America. ABB described Electrify America as the biggest electric vehicle infrastructure project to date in the United States. This is an initiative to install electric vehicle chargers at more than 100 Walmart locations across 34 states next year—that is, said pv magazine, by the end of 2019, the chargers will be either installed or under construction. It will deploy over 2,000 chargers across sites. "Electrify America aims to invest a total of $2 billion over the next 10 years in electric vehicle infrastructure and education," said pv magazine. Electrify America's plan involves placing chargers on highway routes at intervals of no more than 120 miles (195 kilometers). ABB's Terra HP chargers are compatible with CCS and CHAdeMO DC fast charging standards.